Conversations with Millionaires reveals what self-made millionaires do to get rich that you never learned about in school! It features the insider secrets of 9 famous and highly-successful self-made multi-millionaires. After I was a Featured Success Story on a TV Infomercial called 'Creating Wealth' I was interviewed on a radio show. 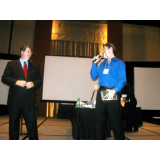 The host of that radio show then went on to interview my mentor Robert Allen and a bunch of other self-made millionaires. That's when I came up with the idea of turning the interviews with those millionaires into a book called "Conversations with Millionaires'.